microglyph Codes are permanently and robustly applied to glass surfaces. A CO2 laser delicately engraves the code on the surface, without impairing the structure of the material. Colored and colorless glass is suitable for being marked. 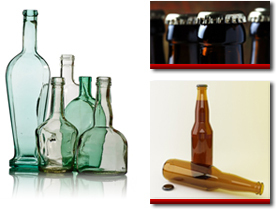 Examples are returnable bottles, perfume bottles, car glass and many more. Another marking method on glass applies Nd:YAG lasers in combination with specialized foils.